This recipe is another Rick Bayless original. 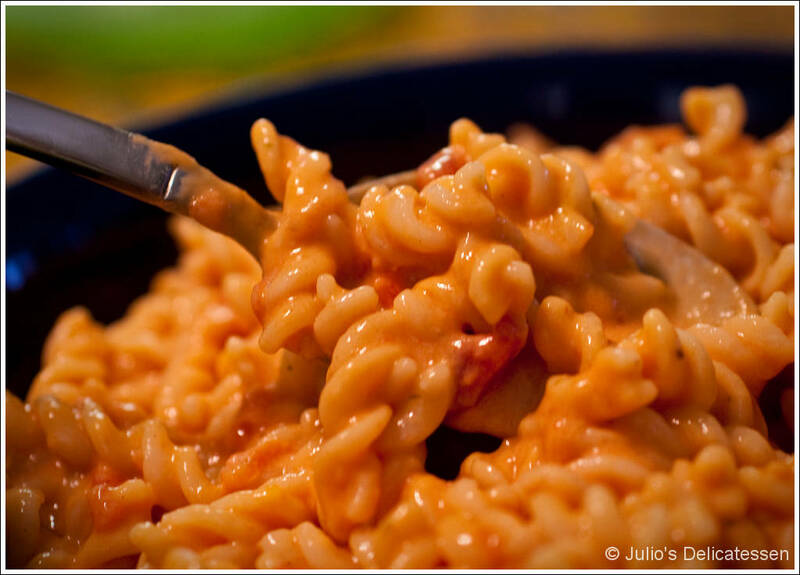 It’s really just a standard mac and cheese recipe with some jarred (or homemade) salsa included. Because we made this for a family meal, we used mild salsa, but this would be even better made with a fairly spicy salsa. 30 Minutes before eating, put a large pot of salted water over high heat. Bring to a boil. 20 minutes before eating – in a separate saucepan, melt the butter over medium heat. As soon as it has melted, add the flour and whisk nearly constantly for about 2 minutes (or until the mixture begins to turn golden brown). Add the milk and continue whisking until the mixture comes to a boil – about 5 more minutes. 12 minutes before eating – add the dried pasta to the boiling water. Stir occasionally. 10 minutes before eating – Remove the milk-flour-butter mixture from the heat. Add the salsa and cheese and stir until well combined (and until the cheese is melted). Just before you’re ready to serve, drain the pasta, add to the sauce, and stir until the pasta is well-coated.